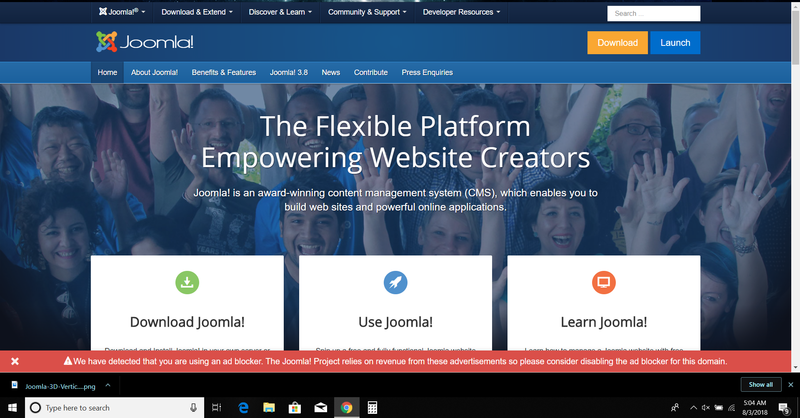 Joomla, another of those pretty popular options after WordPress when it comes to content management system has been around for 12 years. It remains the second most popular CMS option after WordPress with a market share of approx 7% and has been downloaded over 93 million times as of the May-2018. Joomla uses the object-oriented programming and has been written in PHP. As is the case with WordPress, it also stores the data in MySQL and MS SQL database or PostgreSQL database (since 3.0). It’s built on model-view-controller web application framework. It works much like WordPress and allows you to use great templates and extensions to extend the website as much as you want. There are over 8000 different extensions available on a free or commercial variant. It also has it’s own page builders and host of tools giving it a more enterprise-ready look out of the box. It has multilingual support and a wide-arrayed flexible widget system. There’s also a community support system here like that of WordPress. Add to it, the improvements Joomla has made over the years, it stands well as a viable option and is used worldwide by many corporates, government and charitable institutions. However, for those seeking a beginner-friendly option, Joomla doesn’t resonate well to the ear like that of WordPress.